As Susan likes to say, our chickens have a very very nice life, and one very bad day; in the case of this batch, that day's already decided: next Sunday, May 24th is chicken processing. So I figured before that day rolls round, I ought to pay a little homage to our brood and the life they've led. We have three sets of chickens here on the farm right now, all pastured, which in our case means that they not only have access to fresh green grass, but (as I can attest) they go out there and really use that grass up -- picking worms, foraging greens, digging up holes for dirt baths -- until the plot is grass has been dominated and we move them on to a new patch. First there are the layers, who, as their name suggests, lay the eggs. They live in the chicken coop with daily access to a lovely green lawn via a guillotine door. The pullets, or layers-in-training, live in a hoophouse in the south pasture next door to their "big sisters" until after the big day when they replace the oldest cohort of layers who will be processed and sold for stew. Finally, there are the broilers who live their 8 short weeks in two moveable hoophouses up in the north pasture near the farmhouse. These are the guys (and girls) who bred expressly for meat. We got our chicks in late March. They arrived just the day before I did. We bought a straight run of 110 Cornish Rock Cross chicks (Barred Rock + White Cornish), which means we got both the boys and the girls, and we split them into two houses. When they arrived, they were a few days old, and unable to do so much as drink for themselves. Before I arrived, Lucy, Colin and Peter had already spent the day before teaching the babies to drink by dipping each feathery head into the water trough. Despite the tutorial, three chicks ended up falling into the water, getting wet, and succumbing to hypothermia. Little chicks need a lot of attention. In the first 3 weeks or so, before their feathers fill out, temperature is everything. 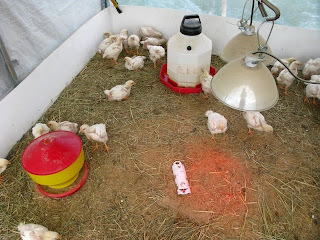 The intern rotation put me on chicken duty, so in my first 3 weeks, I became responsible for monitoring and tweaking two heat lamps and an electric heater four to five times per day to make sure the chicks stayed at a toasty 90 degrees. 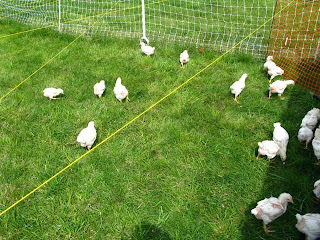 During this time, the chicks stayed inside the hoophouse -- grass and sunlight didn't figure in until week 4 or 5. 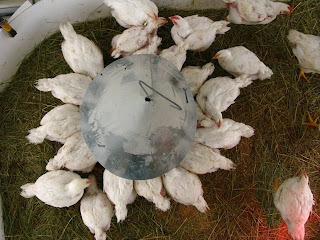 A broiler has been bred for one main vocation: eating. And the daily chicken chores revolve around enabling this passion (and cleaning up after its effects). 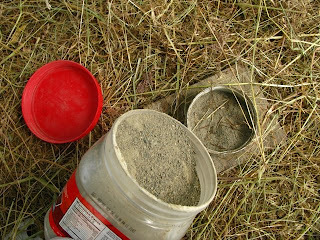 Refilling feed trays, refilling grit (chickens need sand or grit in their gullets to help digest grains), refilling waterers, and managing waste by laying fresh hay or moving the coop wholesale to fresh pasture -- these are the main tasks of the chicken master. 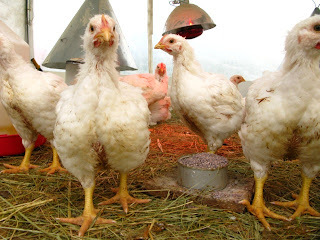 The broilers' personalities are very different than the layers. At the risk of being insulting, I will have to simply call it as I see it and say they're stupider. They don't get out of the way of feet moving towards them. They run into the plastic walls of the hoophouse when the door is open right beside them. And when a giant bald eagle landed outside the fence, the chickens were supremely unflapped until the eagle reached through the fence to grab one of their compatriots in its beak. 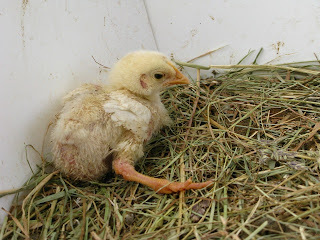 Even so, and despite my hardheartedness, the chicks can tug at my heart, like in the case of a "Limpy," a hen that began its life with problems and continued to suffer "a Failure to Thrive." She persevered for many weeks, until eventually she was separated for chicken hospice. 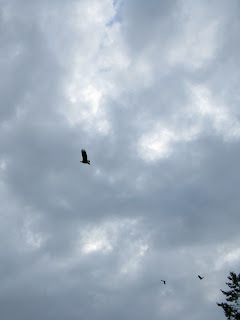 Limpy, plus the three losses to hypothermia, and one gone to the eagle, made for a total of 5 casualties. For the past few weeks, we have been moving the broiler coops everyday at 4pm on a small red dolly to new, fresh grass. It's a lot of work for a few chickens, but I am looking forward to eating some meat, and it's nice to know that they really do seem to have a nice life -- clean surroundings with enough to eat and drink and protection from predators (other than us). It will be very interesting to see how I feel after the day of slaughter. I've been eating a whole lot less meat lately, but I still don't think I have any strong feelings against eating animals that are humanely and sustainably raised. 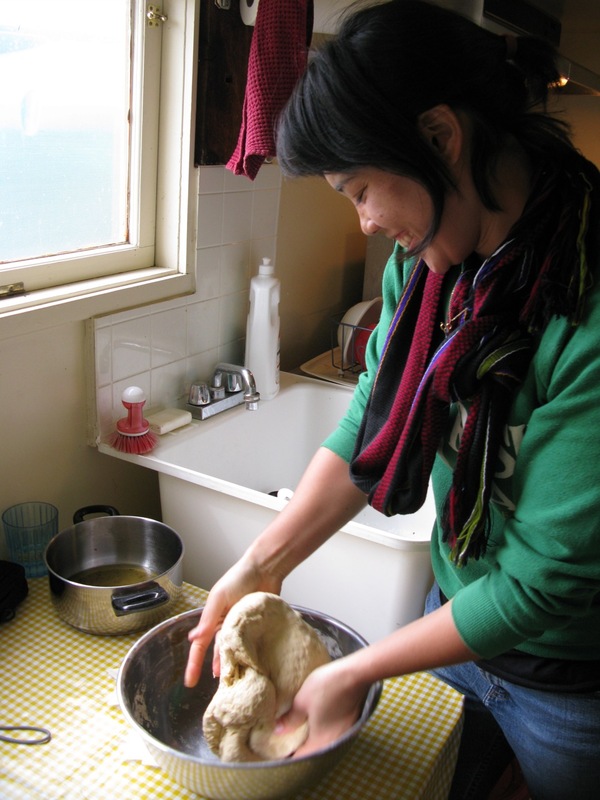 As my good friend Naree notes, there are lots of reasons for being vegetarian. Peter Singer and Jim Mason also make some good points in this book I just listened to. But for me, I guess there are just so many ways to become a more perfect person, and the difference between eating fewer animal products and eschewing them entirely seems personally very stark and unpleasant, but globally, pretty insignificant. This was an especially interesting post! I think my chickens live a charmed life in comparison. They only have Duncan to worry about. That's true. Although once they're too old to lay, maybe you should hire me to dispatch of them.